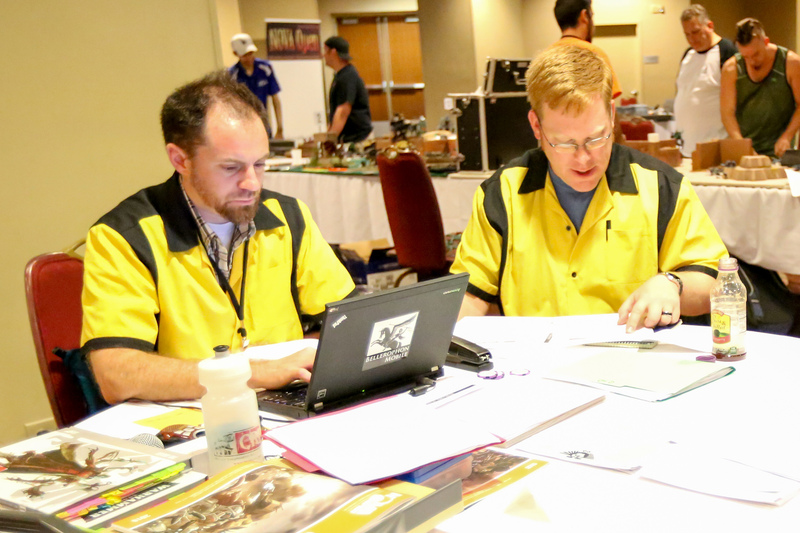 This year Colin and I assumed direction of the 40k Team Trios Tournament at the NOVA Open wargaming convention. It turned out a huge success. Eighteen teams (54 players) participated, doubling the previous participation record. Everything went smoothly, and we had a great group of players and armies. This is a quick recap of the event. A few more photos than those here are in my Flickr gallery. There are also many more in NOVA’s official Flickr gallery for day 1 of this year’s convention. 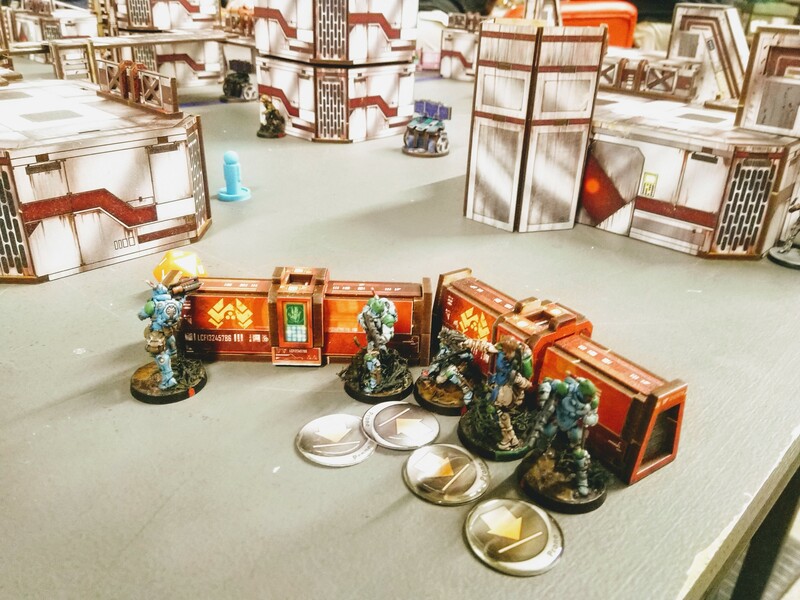 2016 NOVA 40k Trios underway! 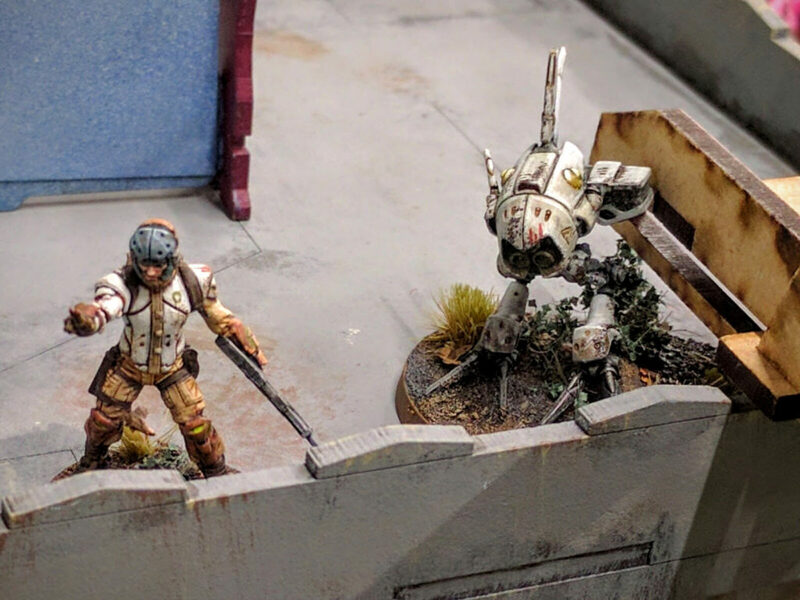 NOVA 40k Trios is a somewhat unique format. 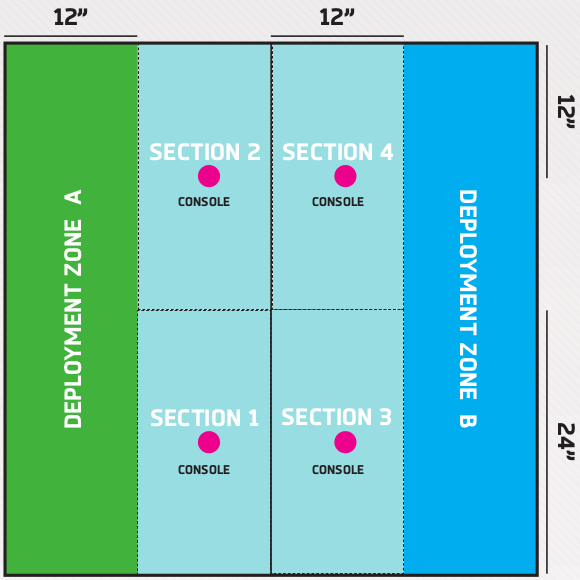 Players register in teams of three. Over three game rounds they play a doubles games with each of their teammates, and one solo game on their own. 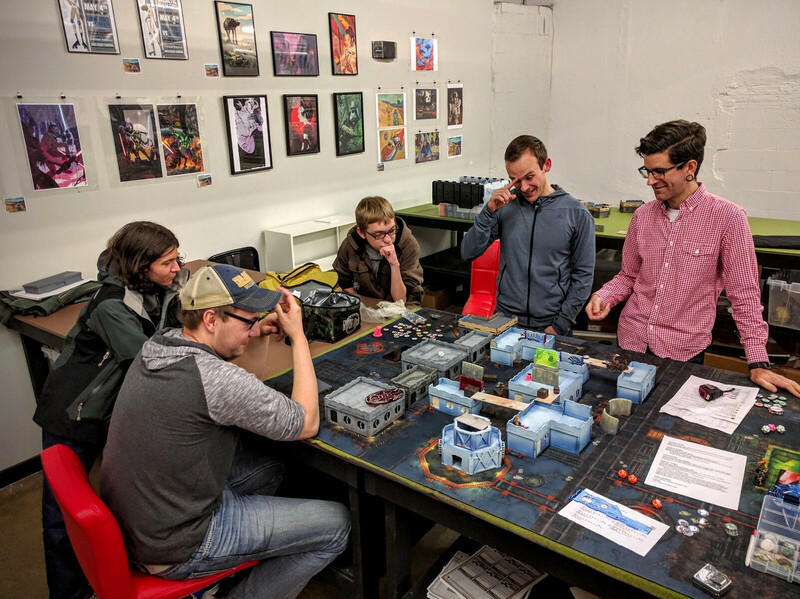 It’s a very friendly format because you’re guaranteed two games playing alongside friends, so relative newcomers tend to enjoy it. Meanwhile, you also get one game to bring out all your toys. That’s actually a big mental challenge, especially for the final solo player of the day. 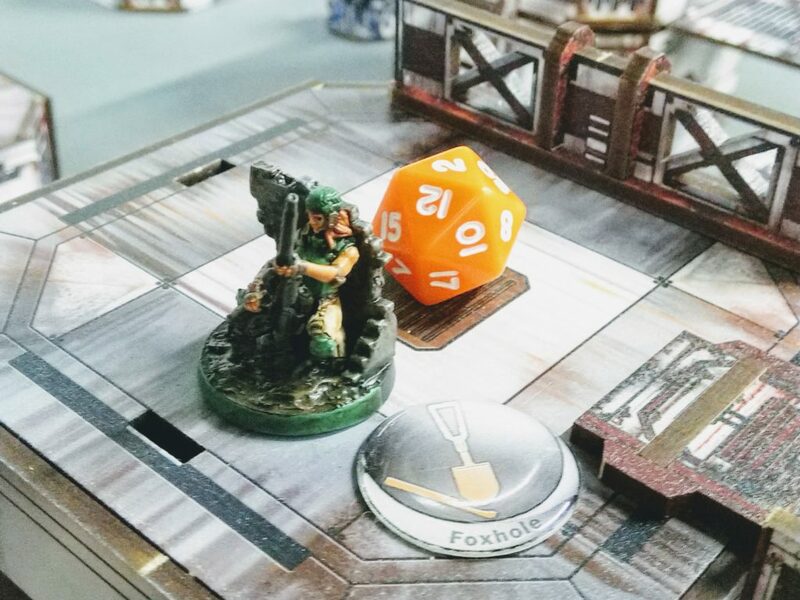 It’s hard to go from playing 1000pts alongside a friend for two games in a row and then suddenly have to efficiently command 1850 points on your own. In addition, NOVA Trios puts a big emphasis on the theme of the armies and crafting a narrative about why these three forces are fighting together. There’s a separate prize for that, and many teams prepare detailed stories, display boards, and supporting materials to present that background. 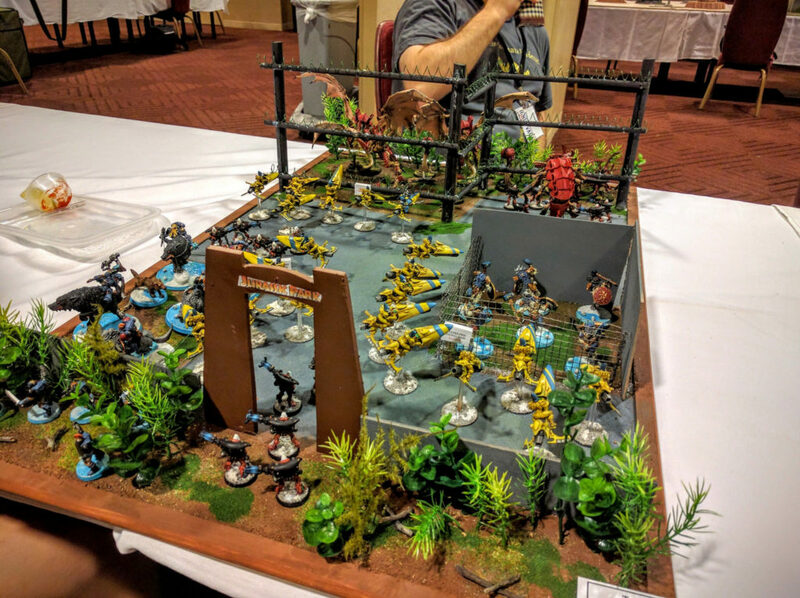 A display board themed around a Jurassic Park of Tyranids. For 2016 we made a number of big updates to the tournament. 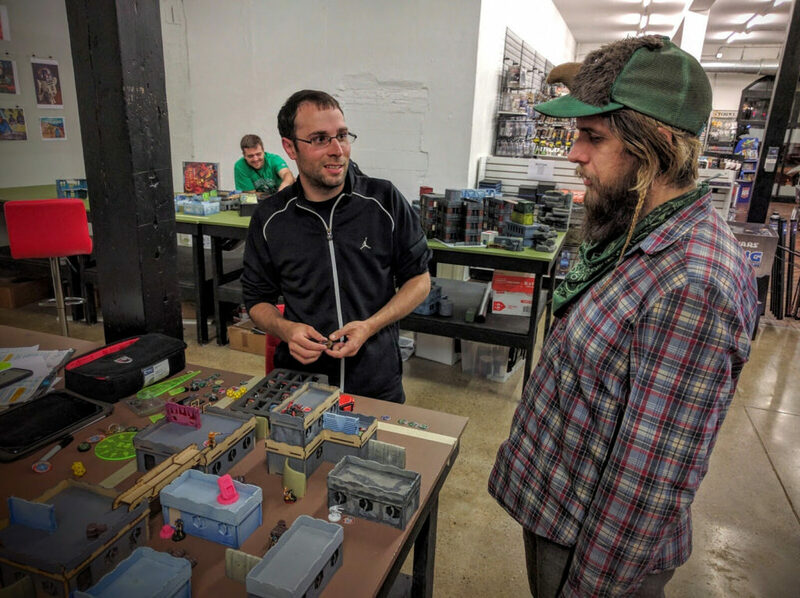 You can check out the full event rulebook for details. In general we put a lot of effort into simply formalizing the event: Fully specified & objective theme scoring, comprehensive mission writeups, and so on, all available online a full nine months in advance. Beyond that, we also added or changed several components. First we dialed the solo game points down a bit, from 2000 to 1850. 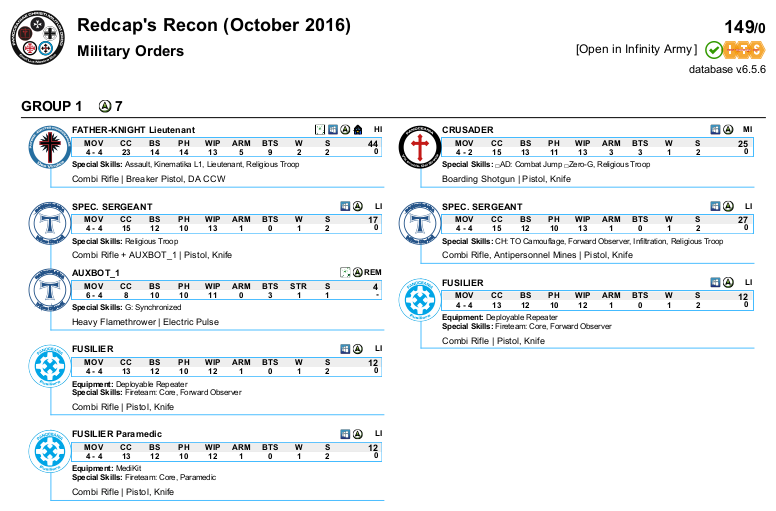 Historically Trios has always run very late and delayed the start of the 40k Narrative well into the night. So we shaved off these points to better foster finishing rounds on time. 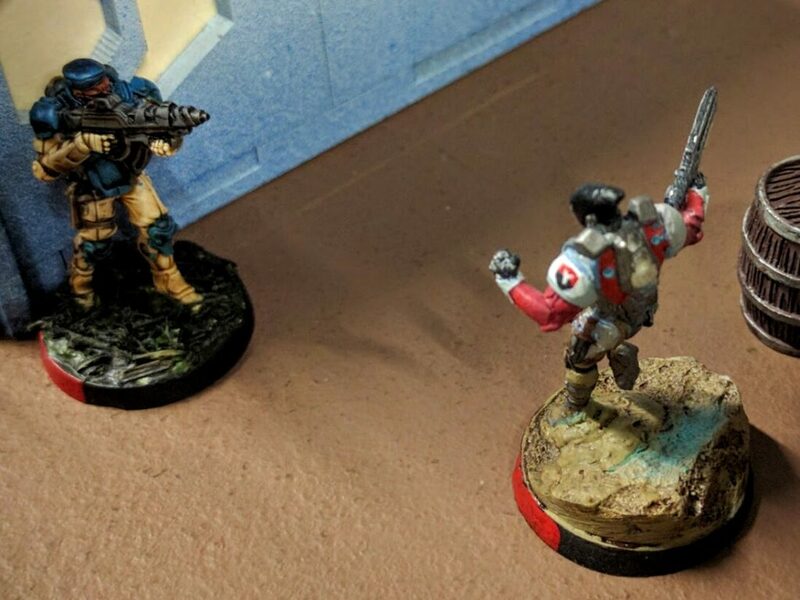 I also believe that playing smaller games reduces many, though not all, of the rock/paper/scissors effects and arguable balance problems present in 40k currently (balance in 40k is a whole other topic—I personally don’t agree that it’s “imbalanced,” but do feel its balance paradigm does not line up with most players’ assumptions and expectations). Conversely, we also allowed superheavies and gargantuan creatures. I just don’t think it’s realistic to not allow these in standard games anymore. 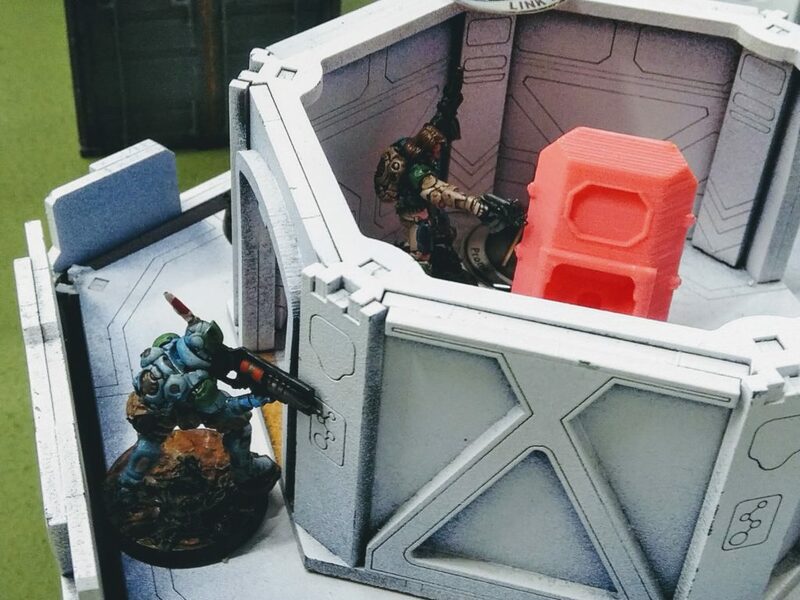 Many factions have access to a big model and rely on them to counter other army designs like deathstars. 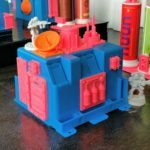 They’re also a huge part of the product line, with multiple fantastic models available, and players want to use their favorite toys. However, there’s a strong argument that many are undercosted, and many casual players are still not prepared to fight them. Our missions therefore include several penalties. Each superheavy or gargantuan in the opposing army gives a +1 bonus to the roll to determine turn order. In addition, every 2 hull points or wounds taken off a big model awards a victory point. We’ve used these rules in tournaments throughout the past two years. 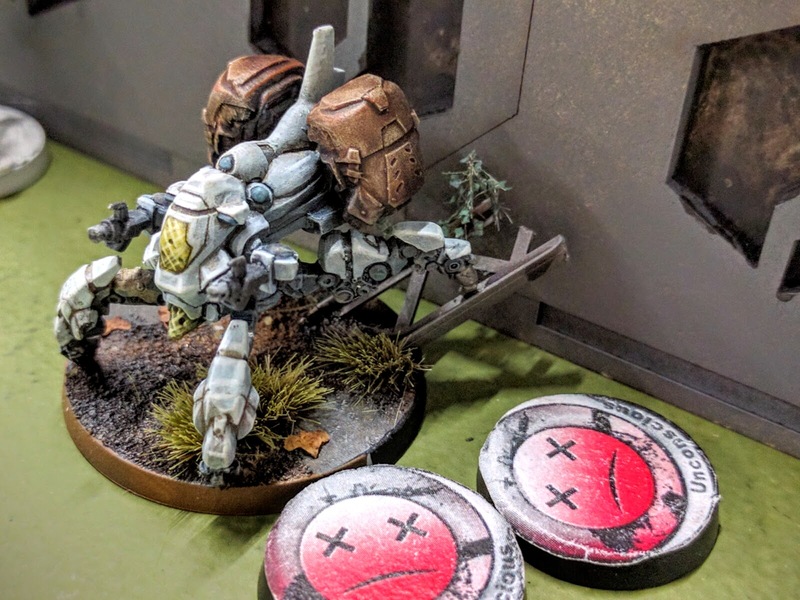 I personally found them a severe disadvantage and stopped fielding my Imperial Knight, while other players felt such models were still worthwhile. So, I think they strike a reasonable compromise, allowing these still controversial models while also reining them in a bit. NOVA campaign badges marking the shoulders of a Space Marne army. We also permitted 30k armies. A bunch of questions came up about how exactly Age of Darkness armies fit in, but nothing too problematic. 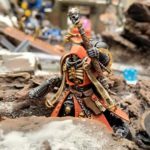 With no 30k events scheduled for Thursday, a fair number of Heresy players joined in and brought great looking armies. 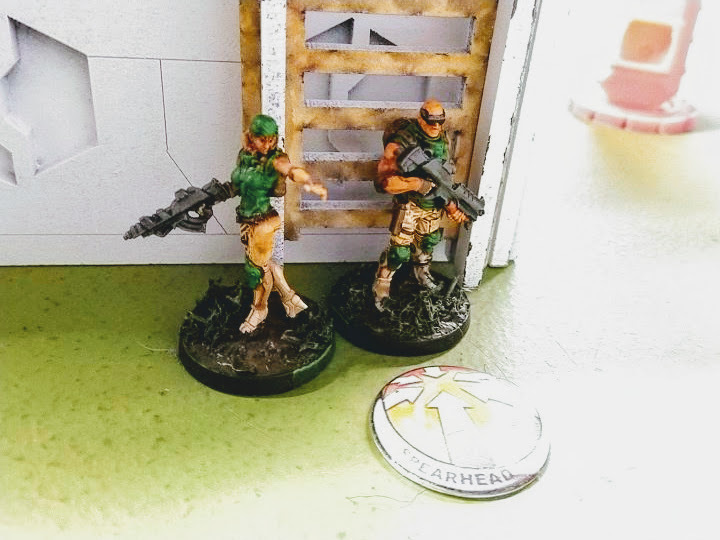 To boost those remaining armies that don’t have access to a codex detachment or useful formations, we also added our Quick Reaction Force detachment. It’s basically a way to take an army with a bunch of elites, focus on either fast attack or heavy support, and in return choose your warlord trait and get objective secured. A number of players made use of it, but not nearly so many as to make clear that it’s overpowered. 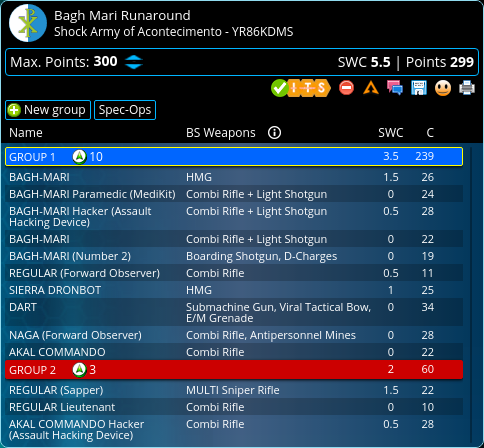 Finally, we added an individual Warmaster scoring track separate from the team scoring. 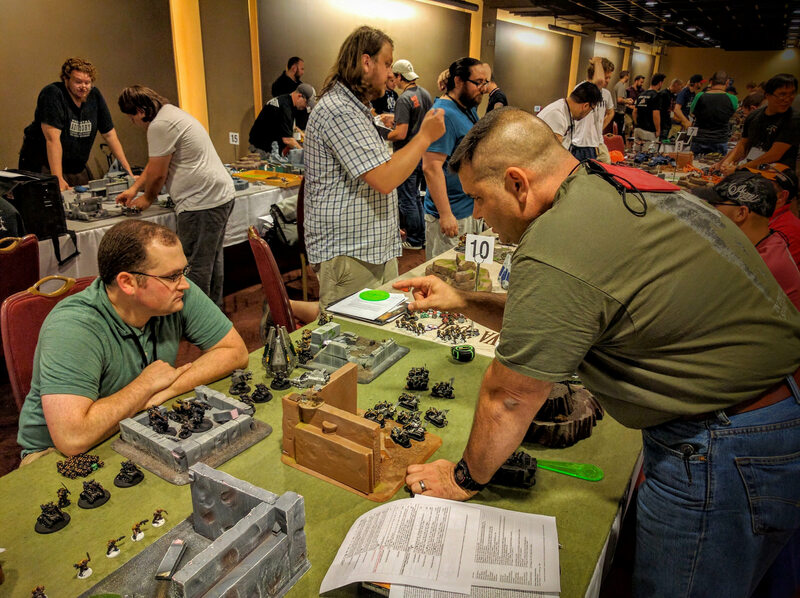 Players were given a list of achievements for their warlord to accomplish and earn points. The primary intent here was to give something for good players on weaker teams to work toward, something for weaker players getting clobbered on the actual missions to try and achieve, and to bring some narrative flair to the games. For some time now we’ve been designing missions around a primary, secondary, and tertiary objective structure, respectively scoring up to 9, 6, and 5 points. 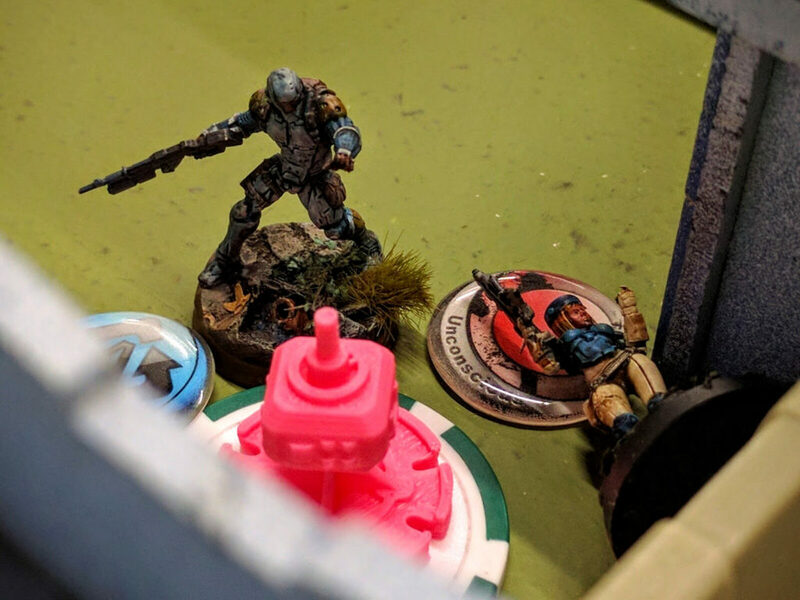 The tertiaries are the standard First Blood, Linebreaker, and Slay, but with the latter two doubled in value, and with an additional Victory Through Attrition objective for damaging superheavies and gargantuan creatures. 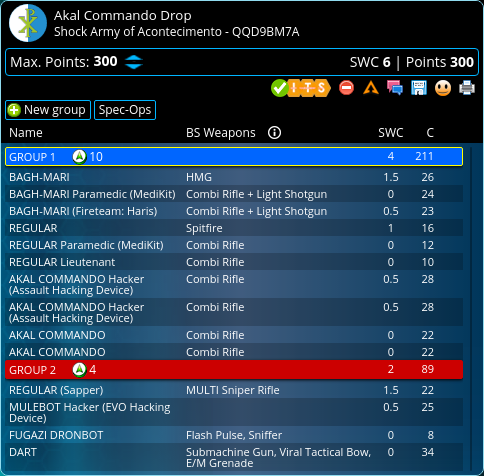 A list of secondary objectives is made available, either for each mission or events as a whole, from which players choose. 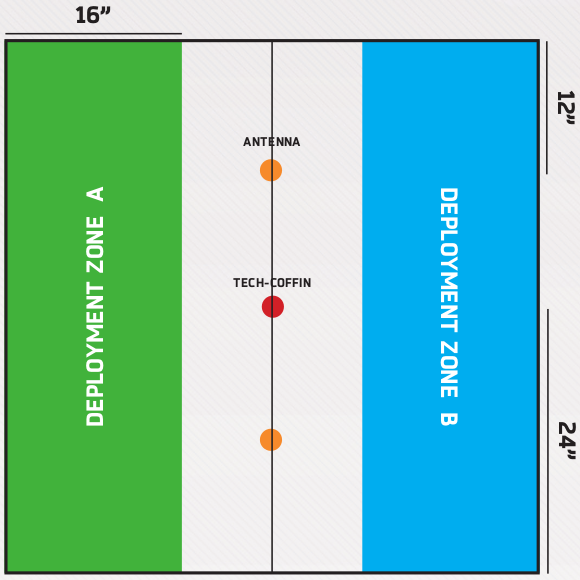 The goal is that they have to play to the mission, as captured by the primary objective. But in choosing a secondary they can tailor their strategic objectives to their strengths and preferences. 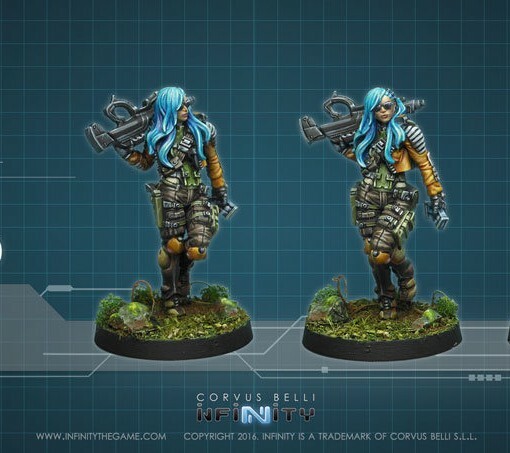 For example, faced with a number of primary objectives, a player with few but robust units might opt for an annihilation-oriented secondary. 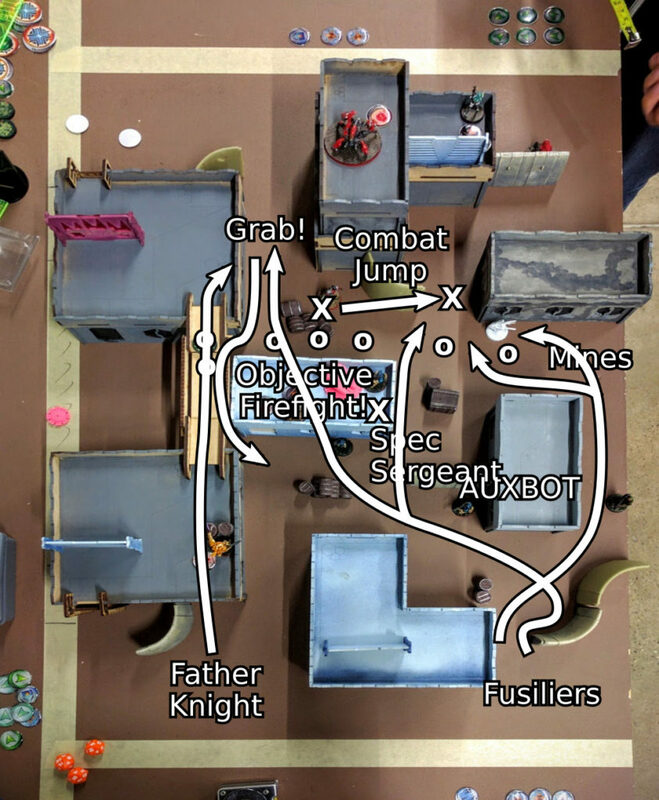 Meanwhile, their opponent with a number of small, mobile forces, might double down on ground control and choose a secondary for claiming terrain or additional objective markers. 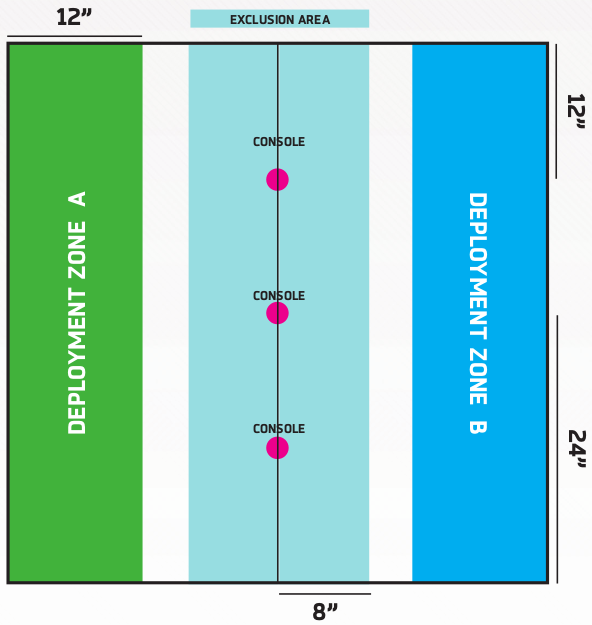 The first mission had players placing four objectives, resulting in one in each deployment zone and two in neutral ground. Players then had a choice of scoring those continuously, at the end of their turns, or at the end of the game. 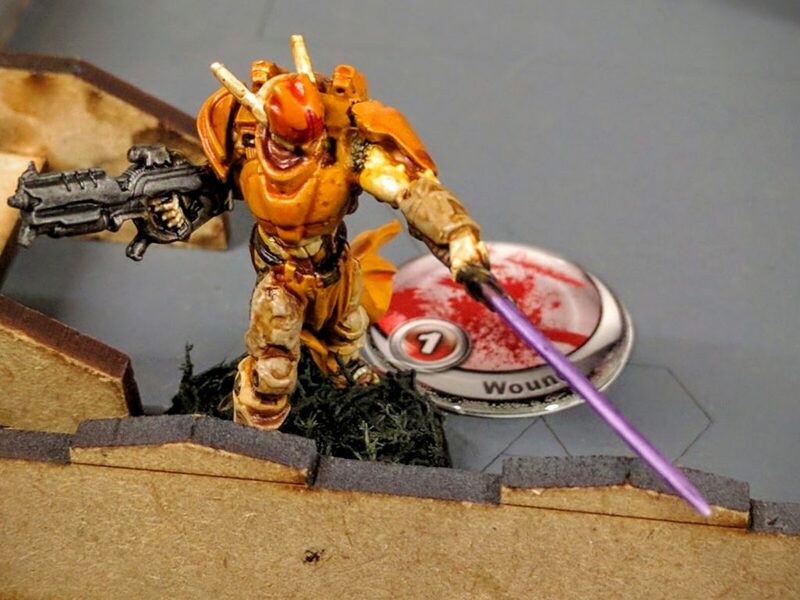 This choice enables alpha strike, high mobility, and attrition oriented armies to all play toward their preferred style and strengths. Booklet presenting the history of the campaign bringing one team’s armies together. 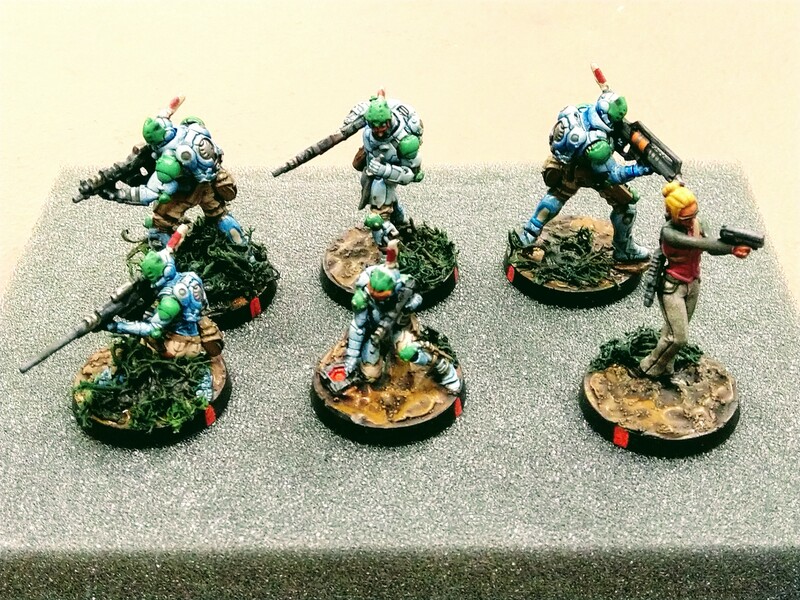 Next up was an annihilation mission, based around eliminating quartiles of the opponent’s army. 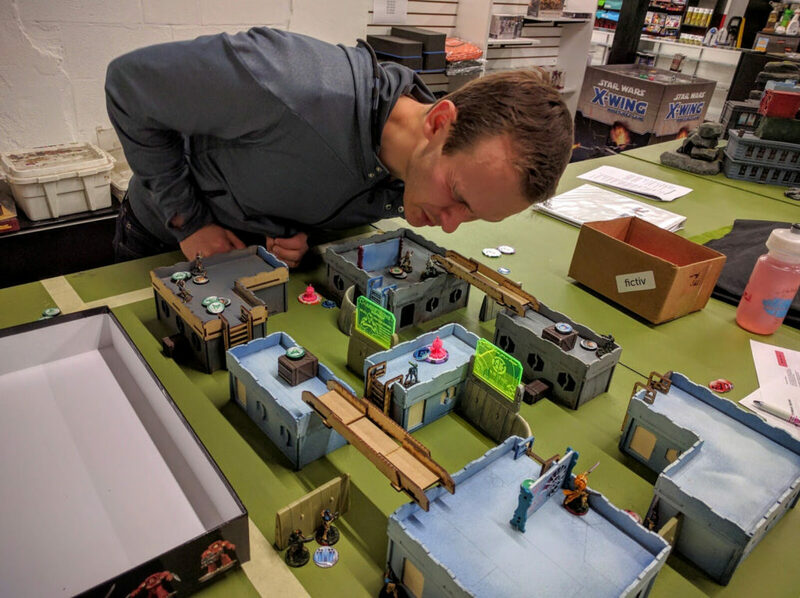 For breaking 25%, 50%, and 75% of their army by unit count, players got 2, 4, and 6 victory points. 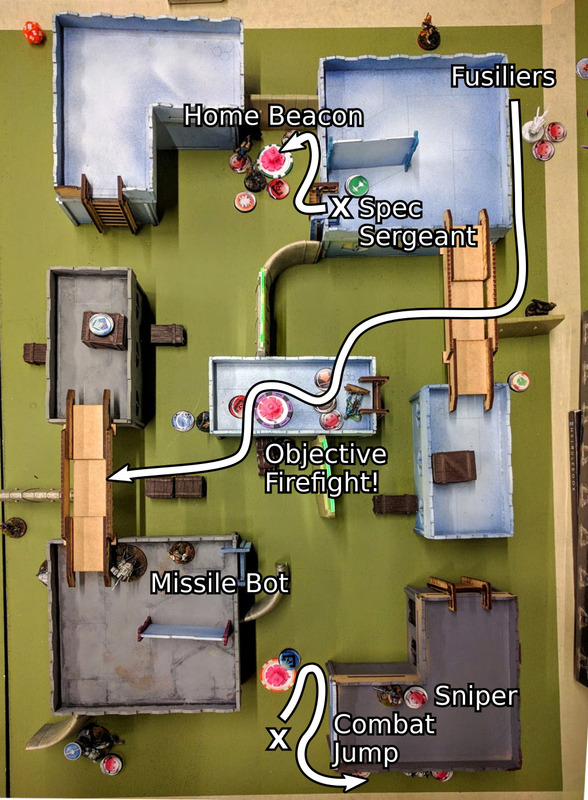 This structure attempts to address some of the imbalances in standard kill point accounting, without incurring complex point cost calculations. The challenge is that armies with many small units, including transports, are inherently at a disadvantage to armies with just a few rock hard or huge units if scoring is done just by counting units removed. 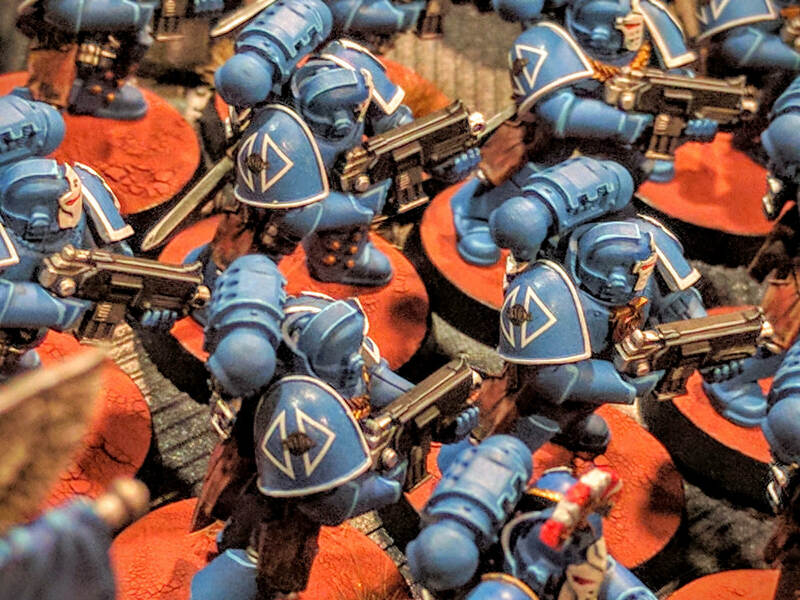 My Kingbreakers pretty regularly field ~20 units, so there’s no way I’ll eliminate more units than, say, a Grey Knights army fielding 4 units. In the quartiles system though it’s more balanced: Eliminating just one of those units is worth eliminating ~5 of mine. Importantly, we’re also able to calculate that outcome without delving into tallying up army points, it’s all based around simple accounting of units. 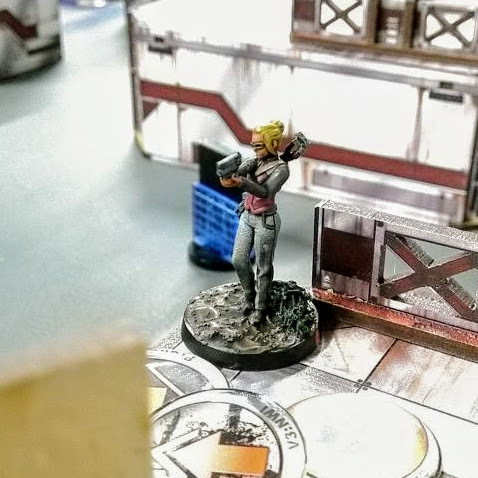 Rounding out the tournament was my take on a Maelstrom mission. 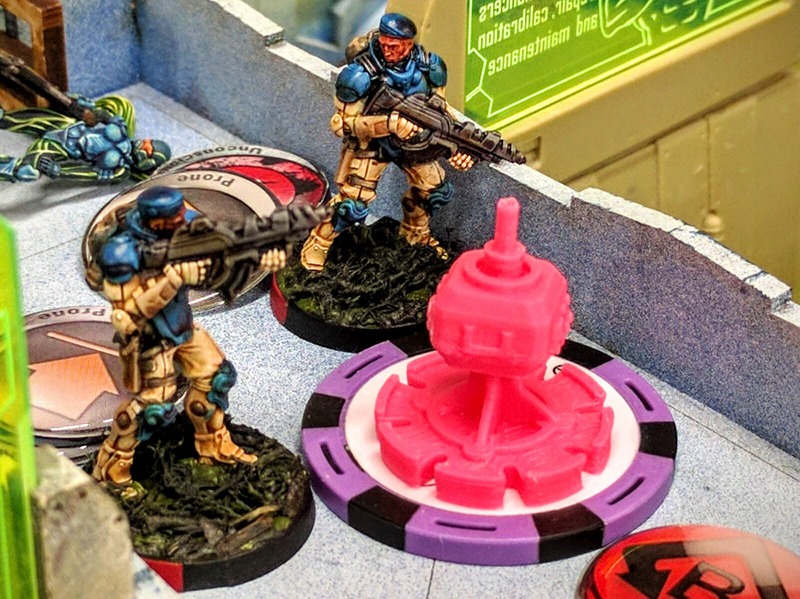 I have a separate lengthy discussion about that, but the core idea is removing much of the silly randomness and forced play in GW’s format, while preserving the required tactical flexibility and also giving more strategic control. This arrangement of missions is not happenstance. 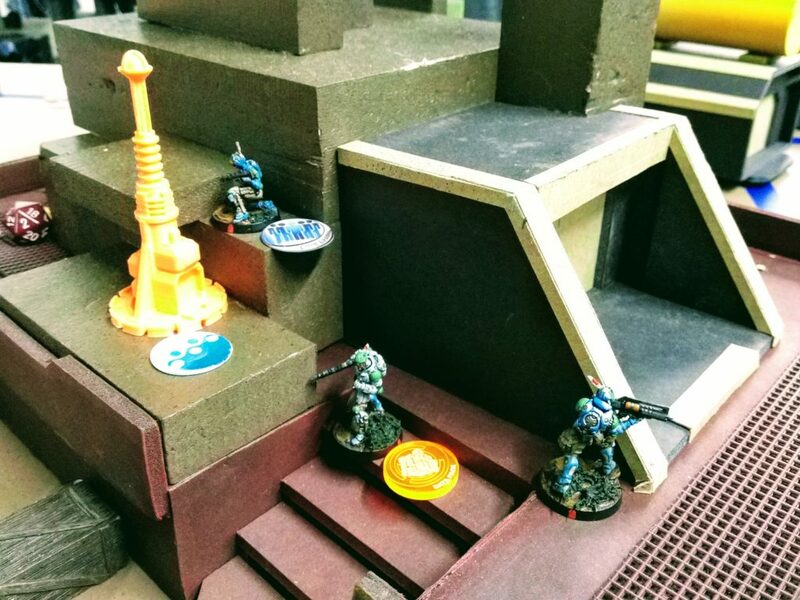 We open the day with a relatively simple, standard mission to get people going quickly and give nearly all armies an even chance through the choice of continuous or endgame scoring. Then the annihilation and Maelstrom missions play off each other. The former somewhat favors armies built around rock units, while the latter somewhat favors armies with many highly mobile, small units. You can’t pass through the tournament doing well by having just one or the other, you need to be able to play against your army’s weaknesses. Dewey (right), NOVA’s head of ops, makes time to compete in the Trios. 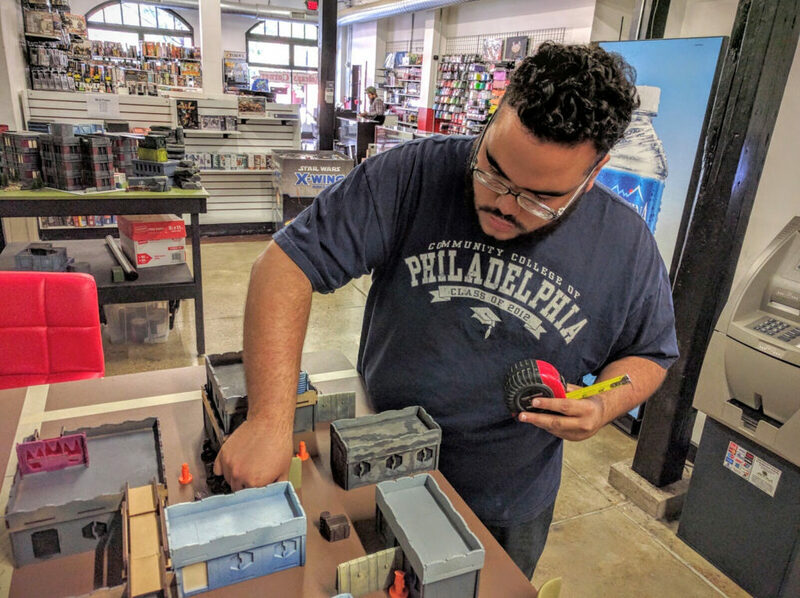 One of the big stories from this year’s NOVA is Games Workshop’s return to organized play. The company donated a tremendous amount of product to both the 40k prize bags and the SuperNOVA swag bags. 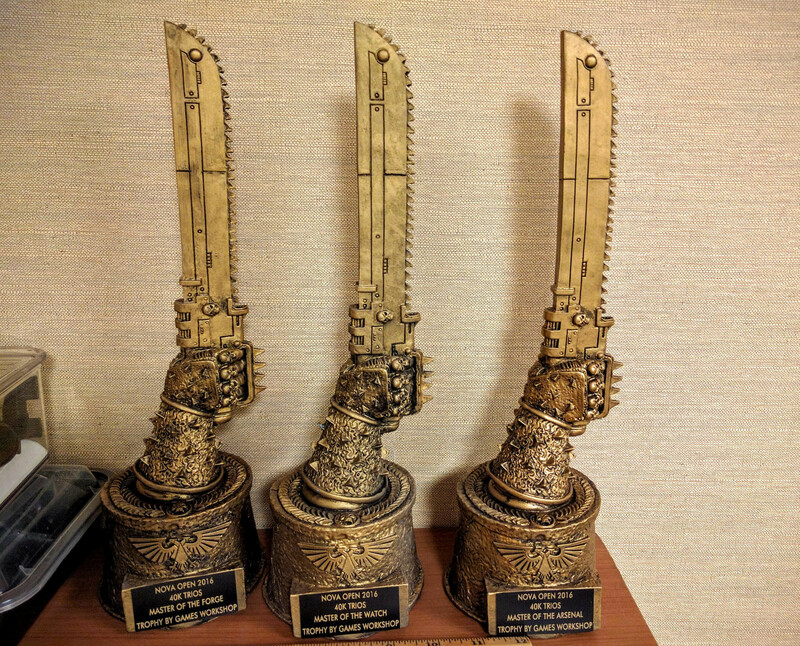 In addition, it provided impressive chainsword trophies to go with the top prizes in each 40k & 30k event, custom sculpted specifically for NOVA. 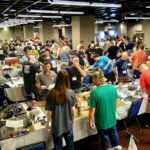 As the first 40k event of the convention, we had the honor to give out the very first NOVA chainsword trophies, carried by hand by Mike Brandt direct from Nottingham in order to be at the event on time, to our Renaissance Trio, the top team from battle points, sportsmanship, craftsmanship, and theme scoring. 40k Trios chainsword trophies, straight from Nottingham. Congratulations to Chris, Steve, and Jhason, for an excellent effort across all fronts and taking top honors! Our storytellers, winners of the theme prize, also deserve special mention. 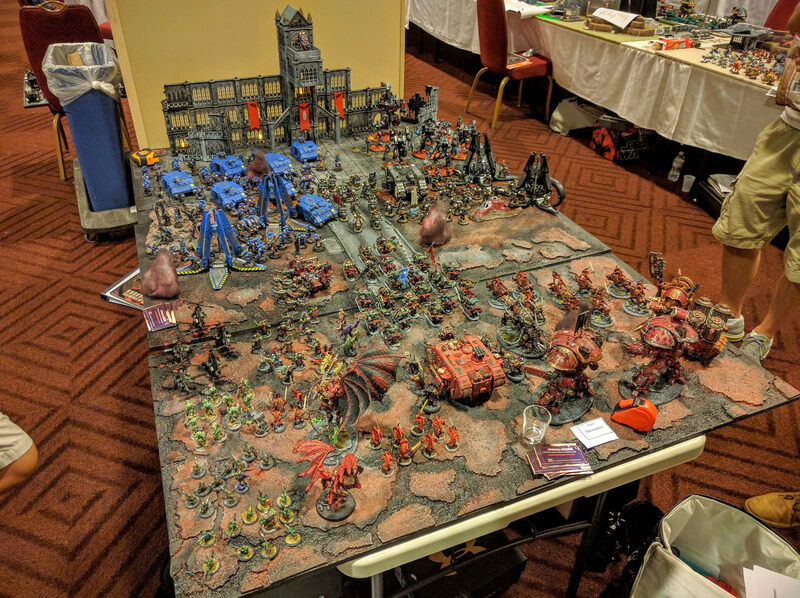 The Victory Gamers club from Northern Virginia had two teams enter, and together they put up a massive display board of the two armies fighting each other. 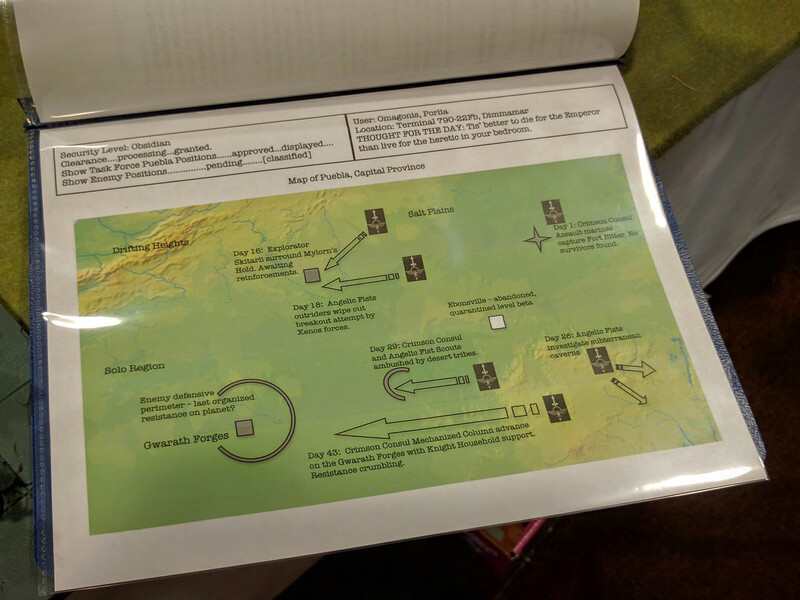 They also had an impressive booklet narrating the battle and armies involved. 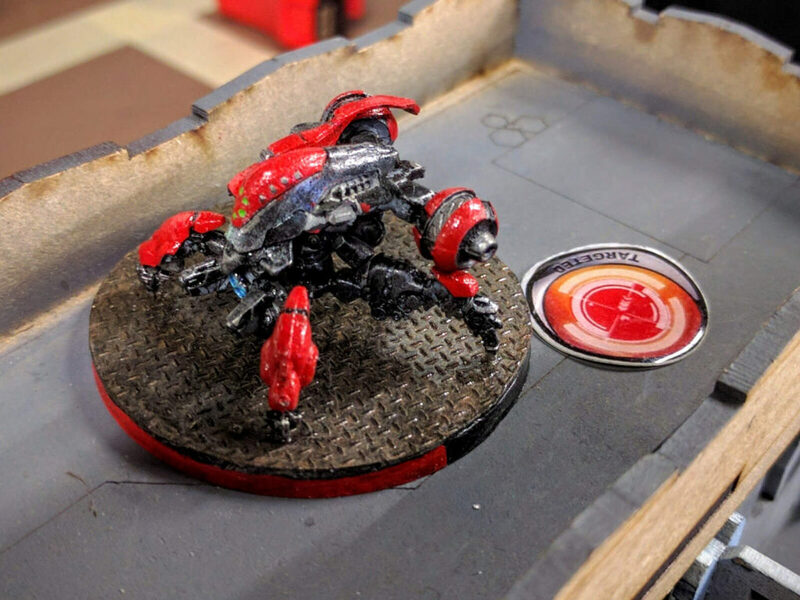 Team Bellicose won the tiebreaker, painting scores from the NOVA Capital Pallette judges, and claimed the prize bags, but all six players deserve commendation. All told this year’s NOVA 40k Trios was an excellent day of gaming. 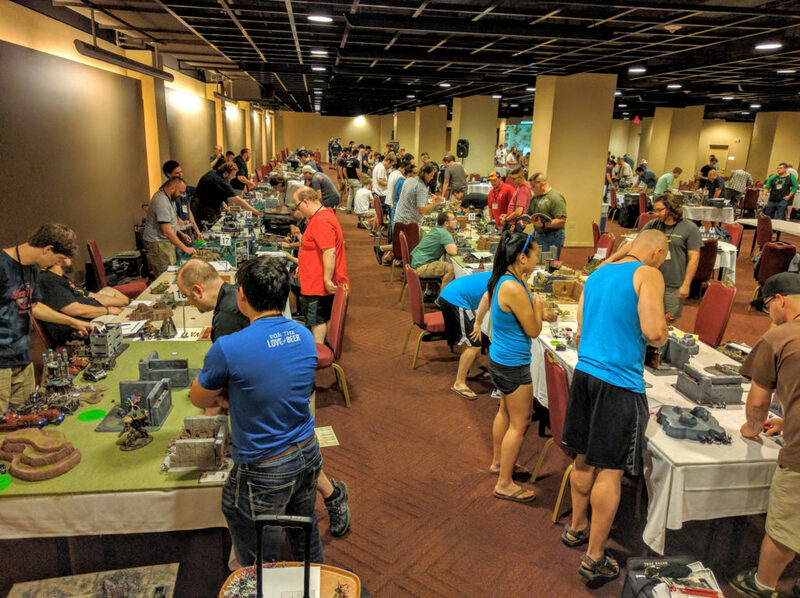 A ton of great people, lots of cool themes and armies, and many fun games. Again, a few more photos than those here are in my Flickr gallery, and there are also many more in NOVA’s official Flickr gallery for day 1 of this year’s convention. 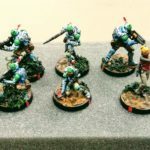 Currently we expect to lead next year’s NOVA’s 40k Trios again, and would love to hear your thoughts. 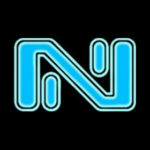 Participants should be receiving a survey email from NOVA, and we hope you’ll all make use of that to provide feedback, or contact us directly. At the moment we’re not planning major changes, just new missions and maybe some revisions to the Warmaster achievements to make that scoring even more thematic and independent from winning games. See you next year! Colin (right) and I entering match results.